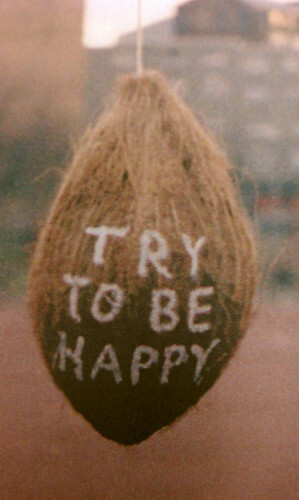 Is this really some kind of coconut festooned with this joyful yet tentative message? I am in the last week, possibly the very last week, probably the very last week of my schoolteaching career. It makes me sad. I have also started an online course for dealing with fibromyalgia. These two things have me facing some of my sadness–that I’m kinda sick, that I’m not really a good teacher anymore, that I might become kinda poor after this, that I am standing before the unknown. These things make me sad. It makes me sad to think that I went into teaching to try to be, as my professor said, “an agent of change.” And for a time I was. I did good work. And then came the NCLB and the high stakes standardized testing, and the distrust of creativity in the classroom, and the push to teach non-fiction rather than fiction, and, and, and mean parents, and lawyers, and program improvement and on and on. And all of that makes me so sad I can’t help but cry. And I think it’s very possible that the only way to move toward happiness (not that that’s even the right goal,I think it’s betterness I’m aiming for) is to acknowledge how sad this is. And how much I wanted to help these kids and how I did for a while, and now I feel that I’ve failed. And so I will try to walk away with my head held high and look toward betterness. This entry was posted in Uncategorized and tagged awareness, books, care of the self, career, fibromyalgia, teaching by Project Easier. Bookmark the permalink. It *is* sad. And. You have not failed; it is just time for you to respond to the many changes in the teaching environment by changing yourself, as you are doing. You are good. Thank you for this honest post. I hope you are doing well as you begin a new phase. Thanks for your comment! It feels scary but good to be starting a new chapter.